Watching the film “Lucy” over the weekend (its number 1 here in Japan’s DVD rental shops) I was amazed that the director said he had talked with at least a dozen Nobel prize scientists before making the movie. Whomever these scientists were, they seemed to live in an alternate Universe, where leading educational theories such as Howard Gardner’s MI theory, the psychology of “flow” and the educational application of neuroplasticity research is unknown. In one of the interviews with a scientist who helped advise the film he talked about the power of ADHD drugs. Its like he was clueless to what psychological researchers know about mindfulness training and how skills are self-constructed by learners over time, through long term practice and application. 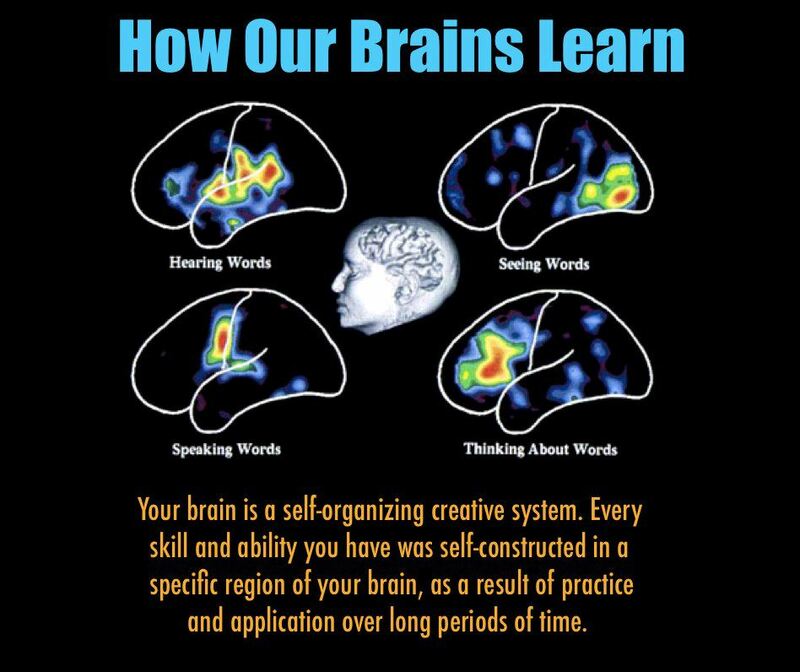 This is neuroplasticity in action, the potential for child to develop a wide range of skills, when their learning and skill practice is fully supported. The film may be correct in saying that most people do not actualize their true potential, but the claim that we use only 10% of our brain is a complete myth. Research into how the brain develops skills and learns shows that we use different parts of our brain for specific tasks and activities. So at any given moment you may use only 30-40%, but as soon as you change what you are doing (driving, reading, talking, cooking, running, playing music, dancing) different areas of the brain will be activated. By the end of the day most areas of the brain have been utilized. 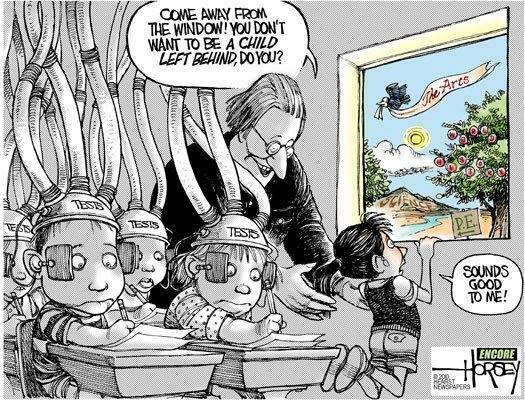 Also, there is no chip implant or magic pill that Monsanto (or the makers of Ritalin) can engineer that will transform children into geniuses. Attention and concentration can be enhanced with drugs, but learning is an organic process, where skills and talents need to be cultivated, practiced and grown over the long term. 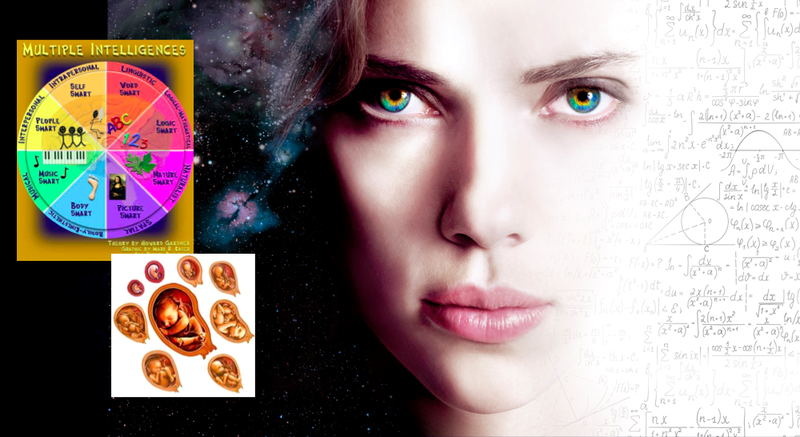 In the film Lucy (Scarlett Johansson) gained her abilities thanks to drugs, losing touch with her empathy, her spirituality, social intelligence and compassion. She basically became a kind of high IQ Terminator robot with a drug addiction. In reality, learning is a highly creative and self-directed process. Human skills and abilities can’t be downloaded like information from the internet, and they don’t work in isolation. 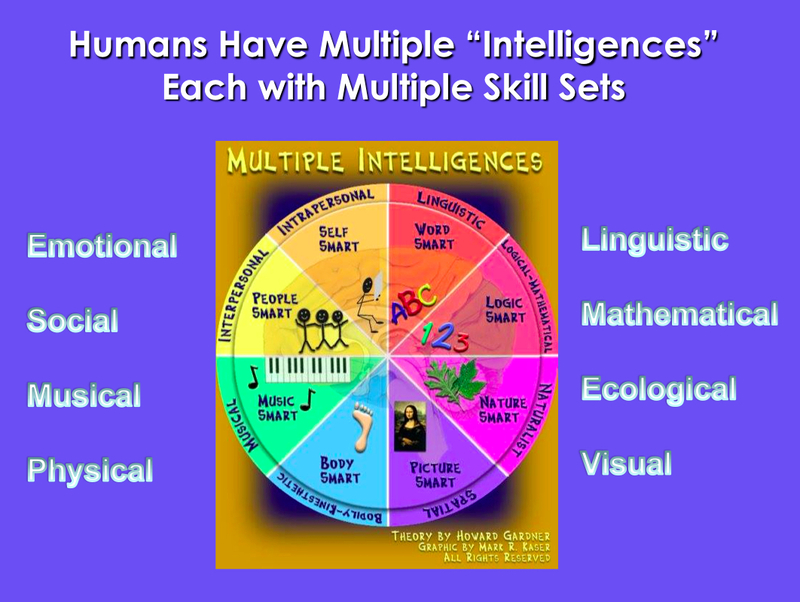 There also appears to be a blending and harmonizing of multiple intelligences that leads to new levels of creativity, flexibility of thought and skillfulness. In a sense, our brains have the ability to work like a jazz quartet or rock band, with multiple areas of the brain firing up simultaneously. Albert Einstein was a model of this Symphonic Intelligence, as were perhaps Gandhi (a skilled lawyer by training), Buddha and many others in the human family who were especially creative and wise. Indeed, I think most of us have experienced this in our lives, where a balance of skills has enabled us to be more creative, flexible and successful. While some scientists believe Einstein’s unique differences may have been inherited there is now a strong body of research into neuroplasticity that shows such differences in brain structure can be grown through repeated effort and practice. This is a revolutionary understanding, a paradigm shift that encourages parents, teachers and students to transform how we think about learning. At the present time, government leaders and education departments in many nations have a very narrow focus, obsessed with the measurement of mathematical and linguistic intelligence, as well as the memorization of information. This is putting a lid on the real revolution in education that should be happening everywhere, helping all children realize their unique symphony of potentials, by encouraging them to practice and develop a wide range of skills. Interestingly, unlike “Lucy,” another recent Science Fiction film, “Divergent” fits the current battle of education paradigms almost perfectly. In that story, society is divided into various factions, where a narrow range of skills are emphasized by each. The heroine in the film is seen as a threat to those in power because she doesn’t fit into any one faction. She has a wide range of skills and demonstrates creative flexibility in her thinking. I wrote a bit about Gardner’s MI Theory and Divergent here. While many children around the world suffer under repressive education “reforms,” fortunately, the “powers that be” do not control every moment of a child’s life. Most important for mastering skills is that children intensively practice what interests them after school, in their free time. That’s how my eldest son became skilled at baseball and swimming, my youngest son at drawing and Japanese calligraphy, and how both of them became bilingual. Their learning in these areas was not facilitated by the Japanese public education system, it happened after school. For many children that’s where the next revolution has already begun, and how we can begin to reach others. This entry was posted in Uncategorized and tagged creative by nature, creative systems thinking. Bookmark the permalink. 22 Responses to Symphonic Intelligence: The Next Revolution in Learning? An inspiration for and confirmation of life-long individual learning. Thank you. Most welcome Jean, thank you! Such an excellent post. So much insight and valuable information. Thanks, Chris. I love this blog and watched the movie “Lucy” too! I am glad that drugs are not the end all be all! Have you seen limitless? Another movie about drugs making people smarter. There is going to be a series coming out too. No, have not seen it. Dangerous ideas, imo. Oh yes! I only watched the movie once and have no interest in the series.